Ops Manager Hangs During MicroBOSH Install or HAProxy States "IP Address Already Taken"
This guide provides help with resolving issues encountered during a Pivotal Cloud Foundry (PCF) installation. Although an install or update can fail for many reasons, the system is self-healing, and can often automatically correct or work around hardware or network faults. Click Install or Review Pending Changes, then Apply Changes again, and the system may resolve a problem on its own. Some failures only produce generic errors like Exited with 1. In cases like this, where a failure is not accompanied by useful information, click Install or Review Pending Changes, then Apply Changes to retry. When the system does provide informative evidence, review the Common Problems section at the end of this guide to see if your problem is covered there. Compare evidence that you have gathered to the descriptions below. If your issue is covered, try the recommended remediation procedures. You might want to reinstall BOSH for troubleshooting purposes. However, if PCF does not detect any changes, BOSH does not reinstall. To force a reinstall of BOSH, select BOSH Director > Resource Sizes and change a resource value. For example, you could increase the amount of RAM by 4 MB. This is most likely a NATS issue with the VM in question. To identify a NATS issue, inspect the agent log for the VM. Since the BOSH director is unable to reach the BOSH agent, you must access the VM using another method. You will likely also be unable to access the VM using TCP. In this case, access the VM using your virtualization console. Access the VM using your virtualization console and log in. Navigate to the Credentials tab of the Pivotal Application Service (PAS) tile and locate the VM in question to find the VM credentials. This handshake must complete for the agent to receive instructions from the director. This key/value pair represents where the agent expects the NATS server to be. One diagnostic tactic is to try pinging this NATS IP address from the VM to determine whether you are experiencing routing issues. Browse to the Operations Manager fully qualified domain name (FQDN). 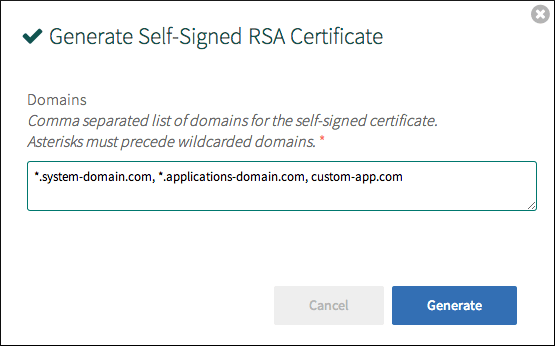 Select HAProxy and click Generate Self-Signed RSA Certificate. Enter your system and app domains in wildcard format, as well as optionally any custom domains, and click Save. Refer to PAS Cloud Controller for explanations of these domain values. If you configure the number of Gateway instances to be greater than zero for a given product, you create a dependency on PAS for that product installation. If you attempt to install a product tile with an PAS dependency before installing PAS, the install fails. To change the number of Gateway instances, click the product tile, then select Settings > Resource sizes > INSTANCES and change the value next to the product Gateway job. To remove the PAS dependency, change the value of this field to 0. PCF displays an Out of Disk Space error if log files expand to fill all available disk space. If this happens, rebooting the PCF installation VM clears the tmp directory of these log files and resolves the error. If users receive Out of Disk Space errors when trying to push apps, this can mean that Diego cells may be running out of disk space capacity. To perform a detailed analysis of disk usage by containers and host VMs in your PAS deployment, see Examining GrootFS Disk Usage. If the DNS information for the PCF VM is incorrectly specified when deploying the PCF .ova file, installing BOSH Director fails at the “Installing Micro BOSH” step. To resolve this issue, correct the DNS settings in the PCF Virtual Machine properties. Use your IaaS dashboard to manually delete the VMs for all installed products, with the exception of the Ops Manager VM. SSH into your Ops Manager VM and remove the installation.yml file from /var/tempest/workspaces/default/. Note: Deleting the installation.yml file does not prevent you from reinstalling Ops Manager. For future deploys, Ops Manager regenerates this file when you click Save on any page in the BOSH Director. Your installation is now deleted. The following sections describe errors that may occur when installing PAS and how to resolve them. If the DNS information for the PCF VM becomes incorrect after BOSH Director has been installed, installing PAS with Pivotal Operations Manager fails at the “Verifying app push” step. Error: ‘mysql_monitor/12a3b456-cd7e-8fgh-9012-345678b90ijk (0)’ is not running after update. Review logs for failed jobs: replication-canary. If you see this error, create firewall rules that allow MySQL to reach UAA, using the MySQL Network Communications topic as a reference. The Ops Manager GUI shows that the installation stops at the “Setting MicroBOSH deployment manifest” task. When you set the IP address for the HAProxy, the “IP Address Already Taken” message appears. To resolve this issue, ensure that the next two subsequent IP addresses from the manually assigned address are unassigned. If you notice poor network performance by your PCF deployment and your deployment uses a Network Address Translation (NAT) gateway, your NAT gateway may be under-resourced. To troubleshoot the issue, set a custom firewall rule in your IaaS console to route traffic originating from your private network directly to an S3-compatible object store. If you see decreased average latency and improved network performance, perform the solution below to scale up your NAT gateway. Navigate to your IaaS console. Spin up a new NAT gateway of a larger VM size than your previous NAT gateway. Change the routes to direct traffic through the new NAT gateway. Spin down the old NAT gateway. The specific procedures will vary depending on your IaaS. Consult your IaaS documentation for more information. This section describes various issues you might encounter when installing PAS in an environment that uses a strong firewall. When you install PCF in an environment that uses a strong firewall, the firewall might block DNS resolution. To resolve this issue, refer to the Troubleshooting DNS Resolution Issues section of the Preparing Your Firewall for Deploying PCF topic.